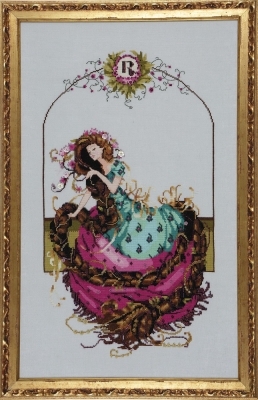 Who is this lovely maiden with tangled locks and alabaster skin, pausing beneath an arbor of dramatic black roses? Perhaps she’s an innocent heroine from a suspenseful tale, awakened by dark dreams. Will she rendezvous with a supernatural lover or will she wander alone, searching forever for her lost soulmate? She is yours to stitch. You decide her fate. 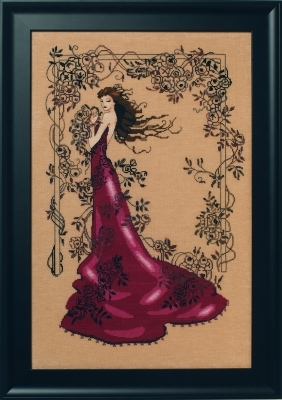 Model stitched on 32 count Amber/Toasted Almond Linen (65-15) by Wichelt Imports. Alternate fabric 16 count Lambswool Aida (355-135) by Wichelt Imports. Stitched area is 13.125″ w x 19.875″ h with a stitch count of 210 x 318. Stitched 2 over 2. Inspired by the Botticelli painting, The Birth of Venus, this sensuous maiden rises from the depths of the sea enveloped in her long lustrous hair. She holds her heart in her hand – perhaps to lure some shy lover? Her tail shimmers in shades of greens and blues, strands of crystals dance in the underwater currents and all is complemented by a regal halo of pearls. 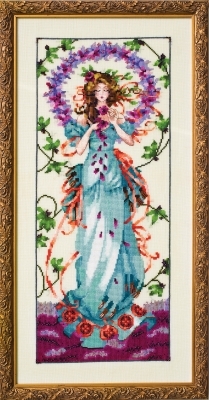 Create your own masterpiece with this stunning new pattern from one of America’s most enchanting designers. 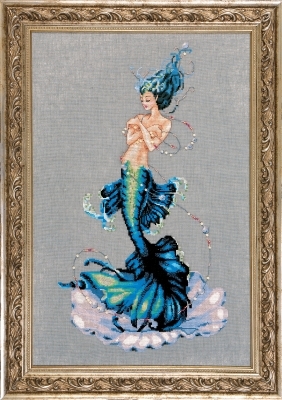 Model stitched on 32 count Sea Spray Linen (65-293) by Wichelt Imports. 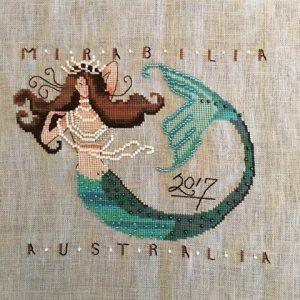 Alternate fabric 16 count Sea Spray Aida (355-293) by Wichelt Imports. Stitched area is 11.69″ w x 17.5″ h with a stitch count of 187 x 280. The queens have arrived. 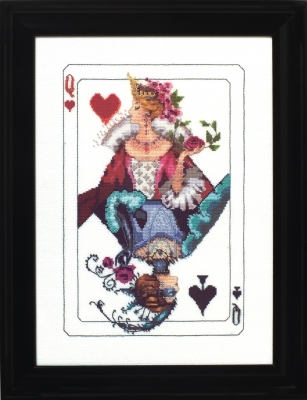 The Queen of Hearts and the Queen of Spades will be obeyed by the entire kingdom. They can be stitched as pictured, or as two separate cards. 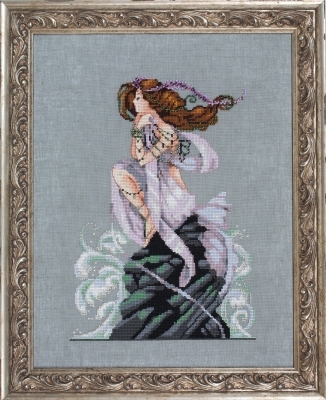 Model stitched on 32 count Optical White Linen (65-20) by Wichelt Imports. Alternate fabric 16 count White (355-1) by Wichelt Imports. represent the constellation within the design. Hers is a dramatic story of monsters and chains and rescue and stellar beauty. She is forever in the stars. 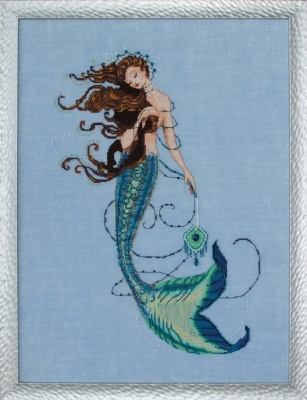 Model stitched on 32 count Twilight Blue Linen (65-18) by Wichelt Imports. Alternate fabric 16 count Twilight Blue Aida (355-180) by Wichelt Imports. 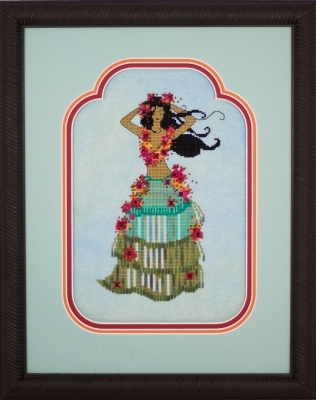 Stitched area is 7.70″ w x 10.94″ h with a stitch count of 123 x 175. Stitched 2 over 2. This is Christmas glamour at its finest. The dress is made of holly, berries, juniper and evergreens. Red satin ribbons flutter. The fragrance of blue green fir fills the air. The stage is set for a lovely Christmas season. Model stitched on 32 count Desert Sand Linen (65-111) by Wichelt Imports. Alternate fabric 28 count Desert Sand Linen (76-111) by Wichelt Imports. Alternate fabric 14 count Desert Cream Aida (357-121) by Wichelt Imports. Stitched area is 10.375″ w x 14″ h with a stitch count of 166 x 224. Stitched 2 over 2. 14 count Aida stitched area is 11.86″ w x 16″ h.
Victorian theater ball gown. She is framed by black Gothic satin and jewels from distant lands. Her jade necklace is the perfect compliment to the shimmering, peacock blue silk. She is sweet and somewhat dangerous. 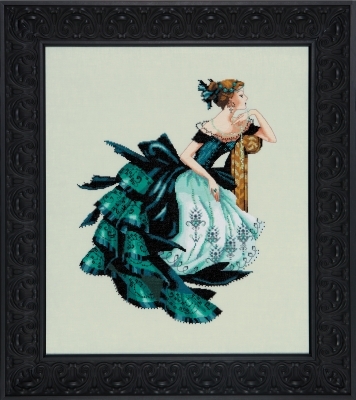 Deep, dark and lovely, Veronica sits in her Victorian theater ball gown. Read more about Portrait of Veronica on the front! 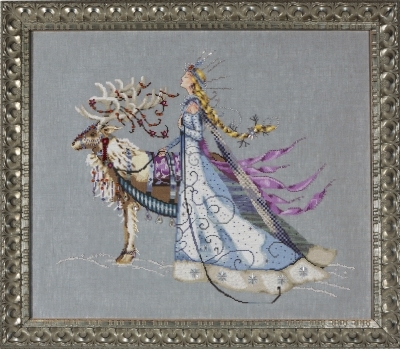 Model stitched on 32 count Star Sapphire Linen (65-113) by Wichelt Imports. Alternate fabric 16 count Waterlily Aida (355-203) by Wichelt Imports. Stitched area is 12.7″ w x 15.9″ h with a stitch count of 203 x 254. Stitched 2 over 2. Let love take root and weave a garden of calm beauty with floss. This golden haired zen goddess is draped in powder blue silk. A halo of blossoms frame her figure. Petals and flowers flow and dance about. I drew this beauty to represent the moment of harmony and peace I experience whenever I make something with my hands. Let love take root and weave a garden of calm beauty with floss. Read more about Blossom Goddess on the front! 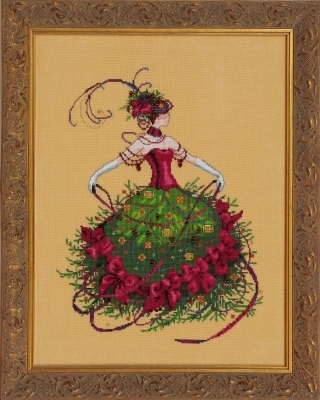 Model stitched on 32 count Touch of Yellow Linen (65-305) by Wichelt Imports. Alternate fabric 16 count Touch of Yellow Aida (355-305) by Wichelt Imports. This pattern is inspired by the German fairy tale published in 1812 by The Brothers Grimm. It is a tale of witches and gardens and towers and long braids woven together. A tale of longing and love that now can be woven with the stitcher’s needle and floss and glittering beads. This pattern is inspired by the German fairy tale published in 1812 by The Brothers Grimm. Stitched area is 10.125″ w x 18.06″ h with a stitch count of 162 x 289. Stitched 2 over 2. From the Mirabilia Minions Retreat 2016. Fabric 28 ct. Caribbean Blue Linen (76-527) by Wichelt Imports. Stitched area is 6.5″w x 10.36″h with a stitch count of 91 x 145. Stitched 2 over 2. Somewhere at the bottom of the Azure sea, a fairylike creature is born from a shell. Her hypnotic songs call to the sailors to follow her to the depths. Her beauty is dangerous and her love is not to be taken lightly. everything is pure and silent. I imagine this is why they name the storms after women.